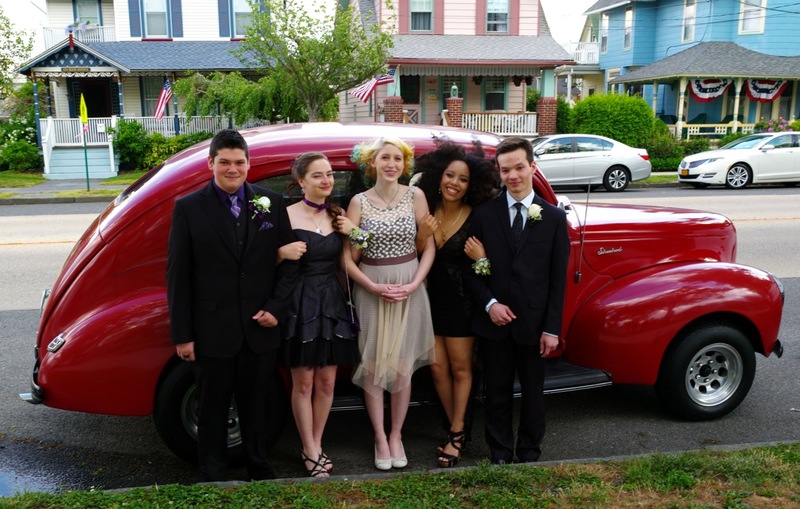 Big Prom night for five Neptune friends. Blogfinger finds them in the Grove….and with a cool car. Next stop is the Jumping Brook Country Club in Neptune. May 22, 2015. Blogfinger photo on Main Avenue in Ocean Grove by Paul Goldfinger. © Click to enlarge. Five friends posing for pictures in Firemen’s Park, Ocean Grove. How beautiful can you look? How wonderful the day? Thus we are re-posting this fine memory for these friends. We found this happy crew standing for photographs in front of the bell, but get outta here! What about that gorgeous chariot at the curb, waiting to take them to the Neptune High School Prom? Let’s take the picture over there. These five Scarlet Fliers are a group of friends—they said so. How lucky can you get? Let’s get close together and how about a big smile? So who do we have here? We have, left to right, Nicholas Severson, Rebecca Sokol, Victoria Alaniz, Sasha Murphy, and Max Schmidt. The red “limo” is a 1940 Ford owned by Michael Yencarelli. The car has been in his family for 30 years. Since we have a car from the 1940’s, let’s go retro for music from that same era. Through the rear view mirror in Asbury Park: The Belmont Hotel, historic turn-of-the-century hotel burns to the ground in 2006. George Tice © Belmont Hotel, Asbury Park. 1974. 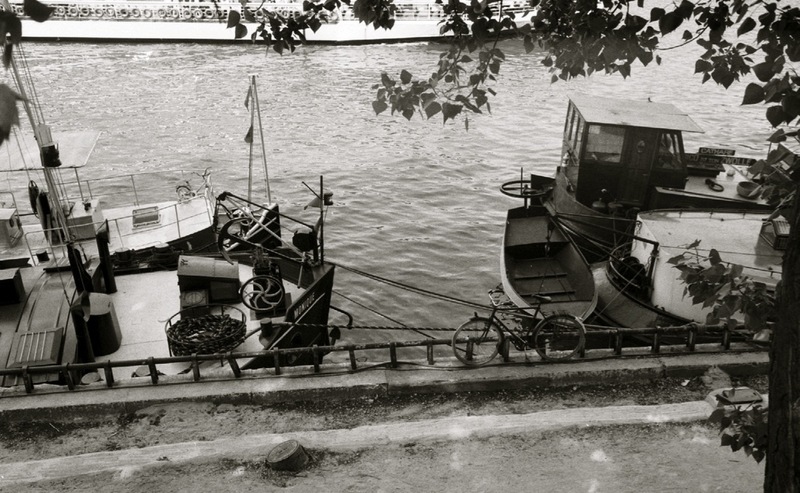 This is a selenium-toned silver gelatin print. By Paul Goldfinger ©. rear view. Photo taken before the Belmont was destroyed by fire. Paul Goldfinger, MD. Editor @Blogfinger. Re-posted from 2016 and 2018. The editor’s note below still rings true in 2019 and has been updated. There were two historic (over 100 years old) hotels in A.Park which were adjacent to each other on Asbury Avenue—-The Belmont and the Atlantic. 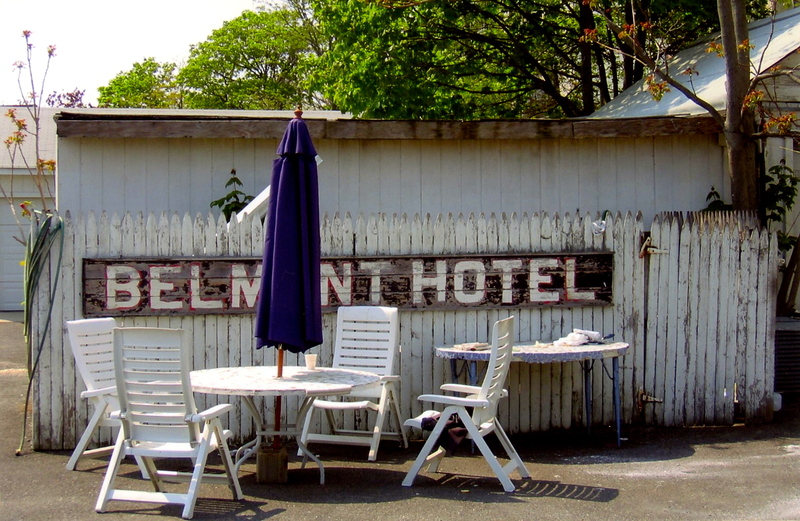 The Belmont had 50 rooms, but it was vacant in 2006. The entire block was scheduled for demolition, but it burned down during a 5 alarm fire, along with the Atlantic, in December of that year. The balloon construction made for a deluge with quick destruction up and down the buildings. An AP historian said, in an APP article, that the buildings were considered historically significant to Asbury Park and Monmouth County. “This site is one of the small remaining number of turn-of-the-century hotels that once flourished,” he said. 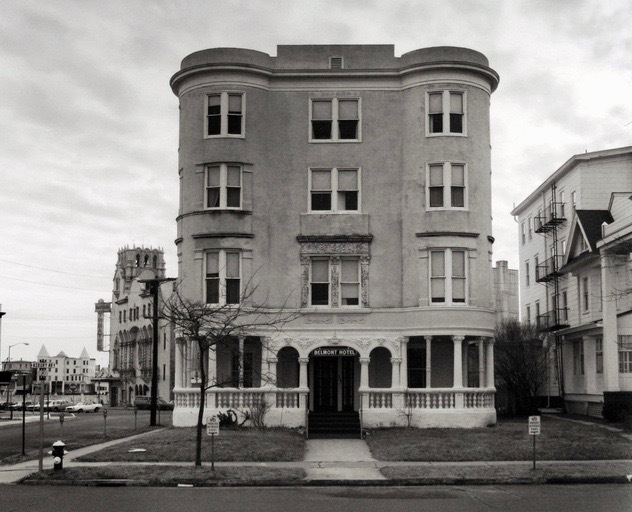 “The local historical society wanted to save the Atlantic and Belmont Hotels and have them refurbished to be used for residential purposes, but the society’s efforts were thwarted several years ago by the City Council and redevelopers,” he said. “And, now that the fire has destroyed the hotels, there is nothing left to do but start from the ground up. They could have been adapted to modern uses, but now they are gone,” he said. 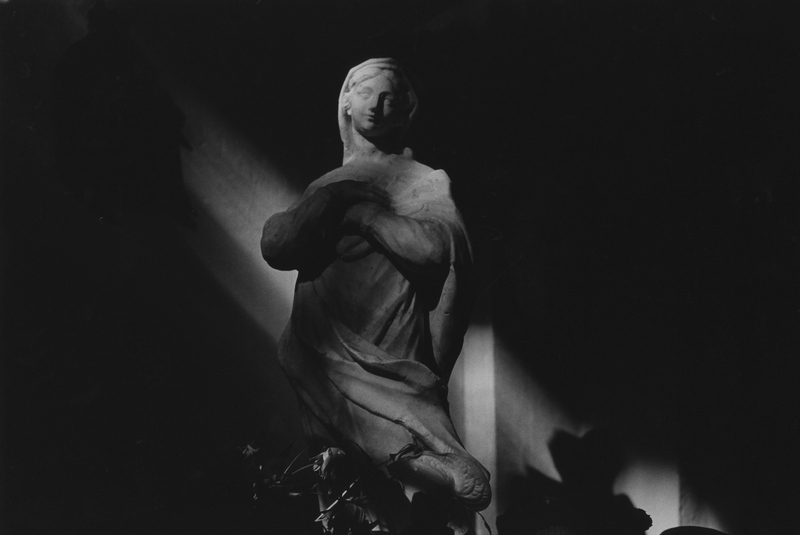 George Tice* is one of America’s most famous photographers. He is especially known for his work in his native New Jersey. His specialty is documenting historic old buildings and neighborhoods, as in his photographs of Paterson, an old immigrant based blue collar city. The Tice photograph above of the Belmont is from an on-line gallery web site (Paddle8). In 1974 he photographed two Victorian houses in Ocean Grove. Tice has published about 20 photographic books including one about the Amish in Pennsylvania and another in Ireland and England called Stone Walls, Grey Skies. A platinum print from that book resides in Ocean Grove. Contact us if you want to view it. One of his most important books is Paterson. PHILLIP SMITH ( of Ocean Grove and the NY Philharmonic) on trumpet along with JOSEPH TURIN on piano play Gershwin’s “Someone to Watch Over Me” Note: I spotted Phil—Phil Smith and the NY Philharmonic–on TV for the Live From Lincoln Center New Years Eve show on PBS. The camera caught him having a string of rests and gazing ahead as Yo Yo Ma played a tango. He has since retired from the Phil, but he still spends summers in the Grove and plays in the Great Auditorium. EDITOR’S NOTE: This article rings true as we think about historic preservation in Ocean Grove. These two Asburian hotels could have been re-purposed into residences while maintaing their historic “bones.” As noted before by Blogfinger, Asbury has an advantage for preservation because of the available land for parking, but that didn’t save these two structures—they were destined to be replaced by condominiums. Evidently the idea of remodeling them into residences was not considered because AP has turned over that entire oceanfront area to trash-and -build-new developers without any worry about history. They don’t seem to care about AP’s history and they don’t mind turning much of their reclaimed property into condominiums. I recall when the beautiful old Metropolitan Hotel, a nostalgic place, which I visited before it’s death spiral, with much history, was allowed to rot and then be demolished. However there is a huge difference between the two towns: Ocean Grove is on the National and State Historic Registers, so we have an obligation to try and save historic buildings and not mow them down like dead ducks. But turning old hotels into condo’s here is contrary to our Master Plan which has a vision that is totally different than Asbury’s, and we really shouldn’t allow more space-clogging condo conversions of old hotels to occur, especially in defiance of RSIS parking standards. Our old hotels need to be dealt with in ways that meet the special needs of our town, with the interests of the people and the history placed ahead of the developers and the politicians who want more money from the Cash-Cow-By-The-Sea. Current related issues in 2018 directs our attention to the Aurora Hotel and the Warrington. We have posted articles about both, and both face an uncertain future in Ocean Grove; and the best we can hope for in both cases would be single family Victorian designer homes. Phil Smith’s solo above (“Someone to Watch over Me”) reminds us to protect our town’s historic treasures. Cingue Terre, Italy. c. 1996. By Paul Goldfinger. © Click left for larger view. Reposted from 2013. Warren Vache on jazz trumpet at Waterloo Village (Sussex County, NJ) c. 1995. By Paul Goldfinger © Reposted from BF 2013. There has always been an active jazz scene in New Jersey. Many well known musicians live and perform here, with considerable overlap in NYC. I’ve heard Warren Vaché at Waterloo Village and at the 92nd Street Y in New York. He was born in Rahway and is well known among jazz musicians. He has a beautiful tone. Many of the concerts in Jersey are sponsored by the 40 year old New Jersey Jazz Society. NJ Jazz Society link . This recording is from an album called “Uptown Lowdown,” a jazz tribute to the Big Apple. Warren Vaché is part of this ten- man band, and I especially like this piece called “Rose of Washington Square/ Broadway Rose.” The clarinet player is the excellent Ken Peplowski. And listen for Warren’s trumpet. Looking for an echo: The Emburys find that acapella street corner “Doo-Wop” sound in Ocean Grove. We found them on a Sunday afternoon performing an old tune by “Shep and the Limelites” in front of the Pathway Market at the corner of Mt. Hermon Way and Pilgrim Pathway in the shadows of the Great Auditorium where, just the night before, the Beach Boys were doing the surfing thing. But today, it was doo wops, and the guys hit the harmonies and the high/low notes with no backup instruments. This music is not easy to do. A small crowd had gathered to give them some deserved applause. *Boogie,” Robert Napolitano, passed on April 27. 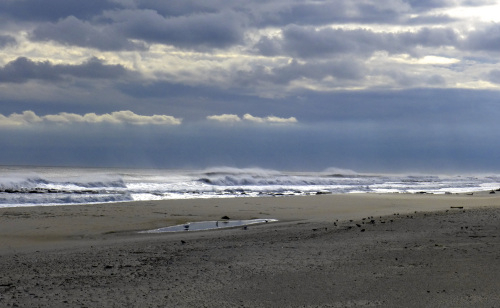 Ocean Grove Weather: January 27, 2012, a special day, but aren’t they all? Ocean Grove. Posted originally in January 2012. By Paul Goldfinger ©. Who knew in January what weather would appear in October? Maybe John Rutter knew. Can you ever have enough of staring at the ocean? Ocean Grove, 2012. Paul Goldfinger photo. © Re-posted from 2013 on Blogfinger.net. By Paul Goldfinger, Editor @Blogfinger (Reposted from September, 2011 on Blogfinger) I like this post, so here it is again; the third time around since 2011. Read the comments. It was 1991, and we were visiting Paris with our son Michael, who had just turned 21. We had been there before and we liked the Left Bank the best, especially the area near the oldest church in town (St. Germaine des Pres) located on the Boulevard St. Germaine. You can walk that neighborhood and find bookstalls along the River Seine, Musee D’Orsay—home of the Impressionists, funky neighborhoods near the Sorbonne, antique shops, bistros where you can’t get a bad meal, small hotels with floor to ceiling windows and no elevators, and wonderful food markets. Behind the old church, where the Blvd. 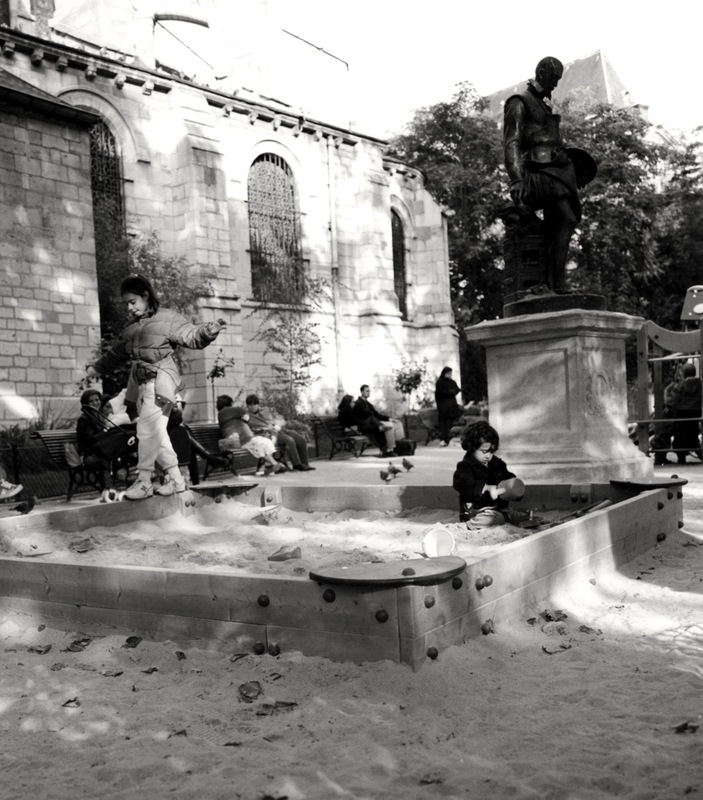 St. Germaine meets Rue de Rennes, is a tiny park where you can relax, called the Rue de l’Abbaye—a respite from the bustle all around it. But also at that intersection is the famous Café Les Deux Magots where Hemingway, Picasso and other artists and intellectuals used to hang out. It’s so much fun to sip an espresso there and people-watch. Park adjacent to the church: St. Germaine des Pres. Paul Goldfinger photo ©. 1991. One evening Michael and I took a walk. At the corner, in front of the church and across from the café, we heard a street band playing. They were called “The Lost Wandering Blues and Jazz Band”, composed mostly of American musicians. But we were most intriqued by their vocalist, a seventeen year old young woman from New York and California who sounded like Billie Holiday. She had been living in Paris since she moved there at age 16 with her mom. Madeleine Peyroux is now a jazz star who performs around the world, but we think of her standing on the sidewalk with a floppy hat on, charming the crowd. As you can imagine, I took a lot of photographs there. Below is the Cafe Deux Magots which dates back to 1875—just a few years younger than Ocean Grove. And below that is Madeleine Peyroux singing in French. The song is “J’ai Deux Amours” (I have two loves). It is from her album “Careless Love.” That’s a good song for an album with that name. MUSIC. What’s the Most Romantic Musical Instrument Ever? What instrument has stood the test of time as the most romantic musical instrument? No, it’s not the organ. And no, Mr. Wiseguy, it’s not the bass drum or the electrified flute. Now I suppose, if you want to stretch the definition of a musical instrument, you might say the human voice. Frank Sinatra comes to mind. But Stradivarius knew the answer — it is the violin. So here we have the sine qua non of romantic music: Frank Sinatra singing “Close to You” with a lovely violin solo. New Orleans beignets, fresh made, at the Lakes Park Farmers Market in Fort Myers, Florida. by Paul Goldfinger. Originally posted in August, 2012. SOUNDTRACK: It is difficult to try to find music to compliment this photograph of a beautiful and expressive child. What words would convey the right description of the moment? In the end, I thought of how her parents and family must think about her. So I chose the lovely song “You’re My Everything” by Harry Warren, but I wanted it performed by a jazz musician with the words aside, because a jazz performance allows us to give the music its own meaning if we want to. You’re the song I sing and the book I read. Here’s The Miles Davis Quintet from the “‘Round Midnight” album.